I started dehydrating canned pineapple/pumpkin (whatever is available) and mixing it into Lacey's kibble because we scatter feeding Lacey in the living room (instead of in a traditional bowl) as behavioral rehabilitation for her potty training issue. I'm not thrilled about giving Lacey food out of a BPA lined can and hope my money saving seasonal shopping skills will keep us in fresh pumpkin until at least pineapple season. Lisa hopes four pumpkins will be enough to keep me in pumpkin for the rest of the year. I hope it is only enough pumpkin to last until next week! Last weekend I mention I was having a Dried Dog Pumpkin Chew Makeathon on the Condo Blues/Lazy Budget Chef Facebook page. Many of you asked what I did and how I did it. Here's my dried pumpkin dog treat recipe! Depending upon the size and amount of pumpkin you use to make your pumpkin dog treats, this project may be more budget, than lazy. At least that is what I told myself after I spent the weekend baking, peeling, chopping (and chopping and chopping), and drying Lacey's Halloween pumpkins. Lisa, you can save yourself a bunch of work and just put the baked pumpkins on the kitchen floor. I will handle the rest! If you don't have a dehydrator (Husband bought me this heavy duty portable dehydrator and I love it!) 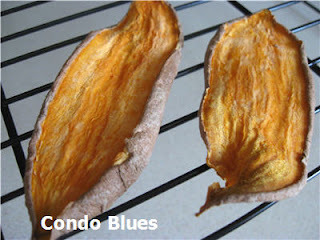 you can make the pumpkin dog chews in the oven although they may not be as dry as the dehydrator method. I would store them in the refrigerator or freezer just in case. Disclosure: I am including affiliate to the items I personally use and cannot live without in this post for your convenience. Now where oh where can I find a dog who might like to eat these pumpkin treats? 1 (or more) baking sheets or a dehydrator - Seriously buy my dehydrator here. You won't regret it! 1. 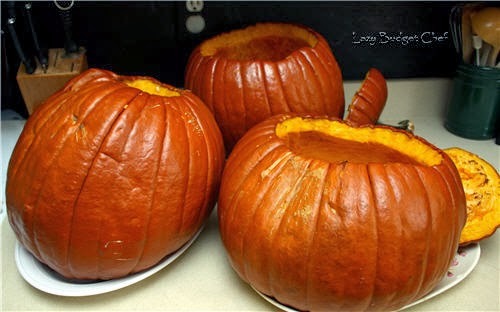 Cut the pumpkin open and scoop out the seeds. 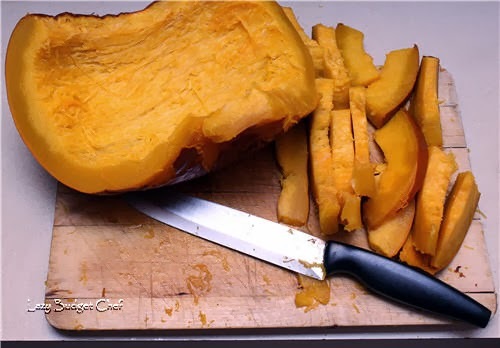 It doesn't matter if you cut the pumpkin in half or further slice the pumpkin into chunks. I cut the top off and baked my pumpkin as is because I wanted to fit as many pumpkins into my oven as I could since I was baking and drying three of them. 2. Bake the pumpkin in the oven for 1 hour at 350 degrees (F.) You can put your pumpkin on a baking sheet or in a dish or be a rebel and plunk it directly on the oven rack. I guess it all depends on what you have and how much you want to risk something spilling in the oven. You can learn more about baking and pureeing fresh pumpkin here. 3. Optional: Remove the pumpkin skin/rind from the pumpkin with the vegetable peeler or knife. Pumpkin rind or skin is safe for dogs and humans to eat. Whether you leave it on or not is up to you. I removed the skin from my first pumpkin while it was still warm and it came off easily. The pumpkin rind was harder to remove when I allowed other three pumpkins to cool overnight. After consulting Google, I decided to keep the rind on the pumpkins because I knew I had a lot of slicing to do. 4. Grab a knife and slice that pumpkin! Thin pumpkin slices will dehydrate faster than thicker pieces. I would aim for slices that are 1/4 inch or less thick, especially if you are going to dry pumpkin in the oven. I cut my pumpkin into slices and cut the slices into cube like shapes because I want to use the finished dried pumpkin as a treat rather than as homemade pumpkin jerky. You can cut yours however you like. It took me four hours to slice three big pumpkins. Good thing I cranked up the jams before I started! The first batch of pumpkin dog treats are ready to go! 6. 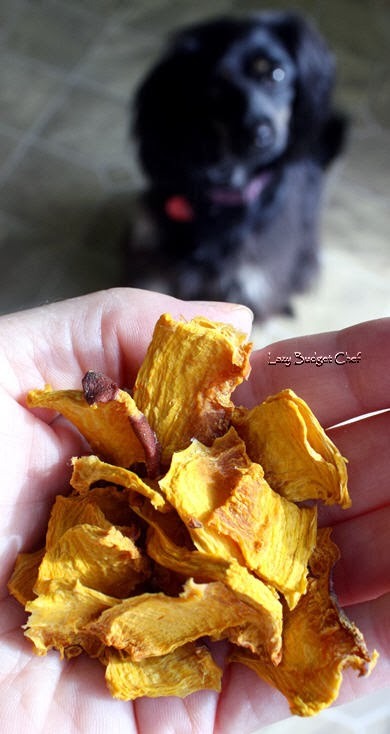 Dry the pumpkin into dog treats. Oven method: Place the pumpkin slices on the cookie sheet and bake in a 250 degree oven for two hours. Remove the pumpkin slices from the oven and turn them over on the cookie sheet. Bake the pumpkin for two more hours. Total baking time: four hours or more depending upon the thickness of the slice. Note: the oven dried pumpkin treats may have a similar consistency as my homemade sweet potato dog chew recipe. You should store the oven dried pumpkin chews in an airtight container in the refrigerator or for a little longer in the freezer. Get my oven dried sweet potato dog treat recipe here! 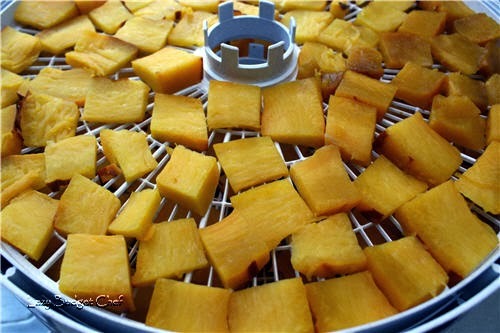 Dehydrator method: Dry the pumpkin at 135 degrees (F) for two to ten hours or more depending upon the thickness of the slice. Rotating the trays in the dehydrator will make sure everything dries evenly and may speed up your drying time. 7. After the pumpkin jerky treats cool, treat your pup right! I ran two of dehydrated pumpkins through my blender to make dried pumpkin powder. I will mix the powder into Lacey's food. One big pumpkin makes approximately one pint of dried ground pumpkin. If I want to rehydrate the dried pumpkin powder into puree for baking, I can make 2 cups of pumpkin puree by adding 2 cups of water to 1/2 cup of dried pumpkin. I stored the other two pumpkins as dried pumpkin slices in mason jars. 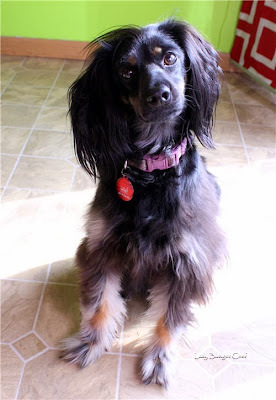 I will those the slices as dog treats for Lacey and to give as Christmas gifts. Yep, our family dogs get Christmas gifts. We are weird like that. 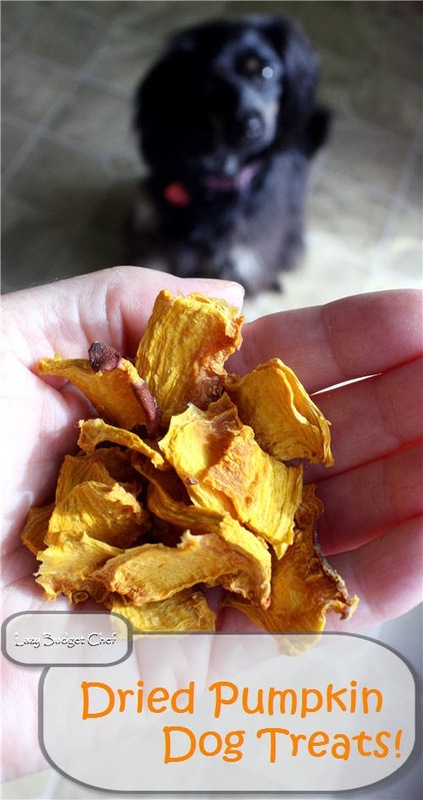 If you'd rather buy than DIY, consider the following pumpkin dog treat options below! Did you like this post? Get more like it by subscribing to the Lazy Budget Chef RSS feed or by subscribing to Lazy Budget Chef by email.